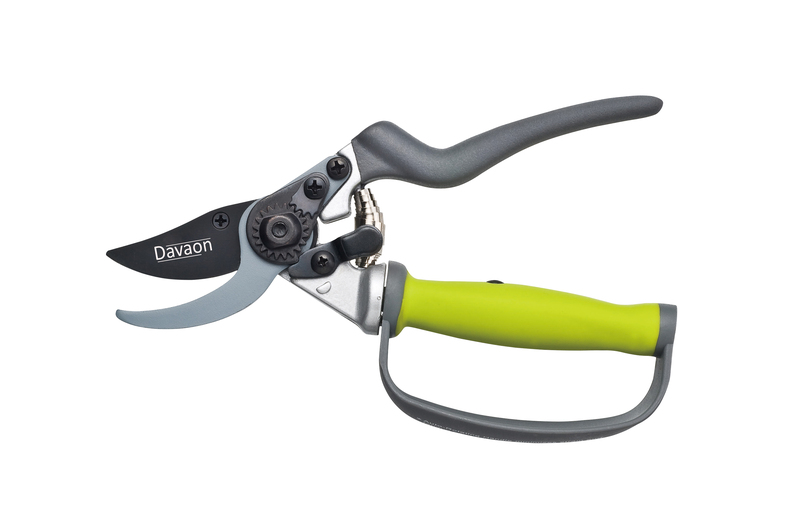 I just got these really great bypass pruner sheers from Davaon. These are really nice pruning sheers. They have super sharp blades, I was able to cut through some pretty good sized twigs and branches with them. They are very durable, even when I cut the larger branches they didn’t break or have any problems holding up. I love the handle on these it spins with your grip so as you pull on it, it moves to accommodate your hand and fingers. It makes for very comfortable and seamless use. I pruned up the bushes in our front yard with these and was able to use them for a good couple of hours without any pain, the hand grip movement really helps to reduce pain and make pruning easier. Very well made and durable. You can also use the locking mechanism to keep them in the closed position when you are not using them. WIDE FINGER PROTECTION GUARD – A Must Have Addition to Protect Fingers from Thorns & Rough Branches while Pruning. Don’t try without it! STRAIN REDUCING ERGONOMIC AUTO ROTATING ANTI-SLIP HANDLE – Lower Hand Pruner Grip Rotates with Your Fingers Natural Movement Ensuring Less Strain, Fatigue and Far Easier Cutting. Our Pruning Shears Are An Ideal Choice. QUALITY MADE PRUNING SHEARS BACKED UP WITH A 100% CUSTOMER SATISFACTION MONEY BACK GUARANTEE – Our Attention To Our Customers is our Priority!